Paring Down Can Foster Indulgence, so Play with Your Food! Some of us subscribe to cooking and recipe sites on the web. Interesting things appear that tantalize the eye and the appetite. Some arouse curiosity and other demand to be made. All those happened when I ran across Chile-Lime Clams with Tomatoes and Grilled Bread. My curiosity was peaked by the inclusion of chick peas (garbanzo beans) in the recipe. I’m most familiar with chickpeas as hummus and don’t have much experience with them as whole beans. What the heck, give it a try! And this recipe for four servings appeared easy to reduce per my goals in this New Season of reduced quantities. It also was flexible enough to allow for loose measuring of ingredients. For instance, it called for 24 clams. Six clams per serving? Pikers! I ordered 12 clams to make one serving. I love clams and had no guilt over this indulgence. When cooking for one, or som times two, indulge and enjoy! I used the recipe below as a guideline for this dish. I played with parts of it, hence inclusion in the Play with Your Food Category. 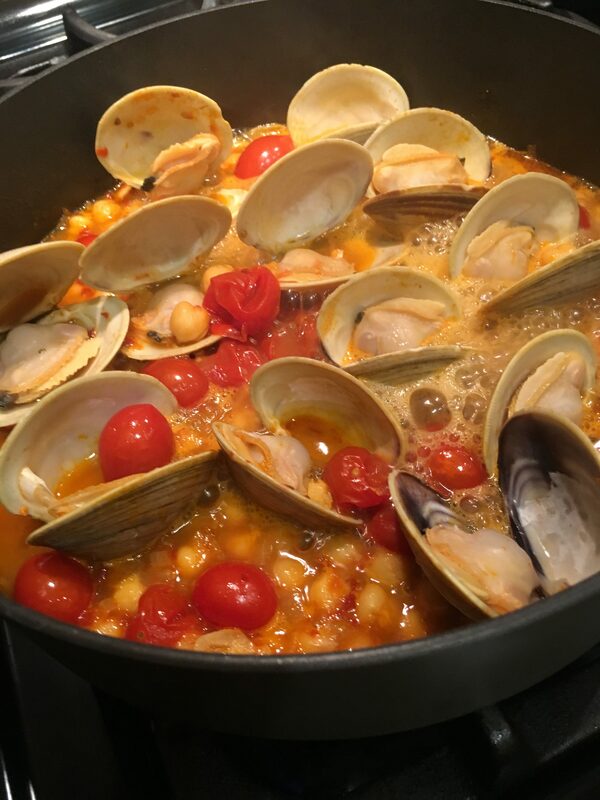 Chile-Lime Clams with Tomatoes. As good as it was hoped it would be! A keeper. The original recipe suggested cooking in a cast iron pan on a grill outside. Think this over… acid foods (including tomatoes) cooked in cast iron can acquire a metallic taste and cause the pans to lose their carefully built up seasoned finish. I read that acidic foods cooked in cast iron for no more than 15 minutes will not acquire a metallic taste, nor will the harm the finish. Not worth the risk on my older than I am cast iron hand-me-downs from early in the last century! It has been unseasonably hot so far this spring and summer. I’m convinced hot air from the Capitol fanned by Tweet kindling is the cause, but that’s a different rant. I chose to cook on the stovetop in an anodized aluminum pan that has a non-teflon, dishwasher safe non-stick finish. I had to forgo grilled toast, but was satisfied with torn chunks of bread with a schemear of butter for sopping up the pan sauce with the meal. This photo is of the pan on the stovetop. I knew a dozen clams in my serving bowl, would be too crowded for a good picture. Indulge me and imagine chopped cilantro sprinkled on top. Prepare a grill for medium, indirect heat (for a gas grill, leave one or two burners off; for a charcoal grill, bank coals on one side of grill). Place a large cast-iron skillet on grill over direct heat (move it around to cooler part of grill as you cook if needed) and melt 4 Tbsp. butter in skillet. Add shallots and garlic and cook, stirring often, until soft, about 4 minutes. Add tomato paste and cook, stirring often, until paste darkens to a rich brick-red color, about 1 minute. Add beer and tomatoes. Bring to a boil and cook until beer is reduced nearly by half and no longer smells boozy, about 4 minutes. Stir in chickpeas and sambal oelek, then add clams. Cover (if you don’t have a lid that fits, use a sheet of foil) and cook, stirring occasionally, until clams have opened; this could take from 5–10 minutes depending on size of clams and the heat level. Remove from heat; discard any clams that don’t open. Stir in lime juice and remaining 2 Tbsp. butter. While the clams are cooking on the grill, drizzle bread with oil and season lightly with salt. Grill until golden brown and crisp, about 2 minutes per side. Transfer toast to plates and spoon clam mixture over; top with cilantro. Serve with lime wedges for squeezing over.